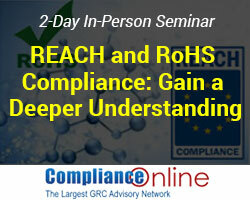 PALO ALTO, CA, UNITED STATES, March 11, 2019 /EINPresswire.com/ -- After a sold-out event in San Diego this February, ComplianceOnline, the leading governance, risk and compliance advisory network with over 700 experts in various regulatory subjects, today announced that it will be conducting its popular seminar on REACH and RoHS Compliance: Gain a Deeper Understanding in Houston, TX, on June 13 and 14, 2019. For more information or to register for the seminar, please click here1. Early bird discounts: For discounts on early registrations, please register now2. For more information on ComplianceOnline or to browse through our trainings, please visit our website3.